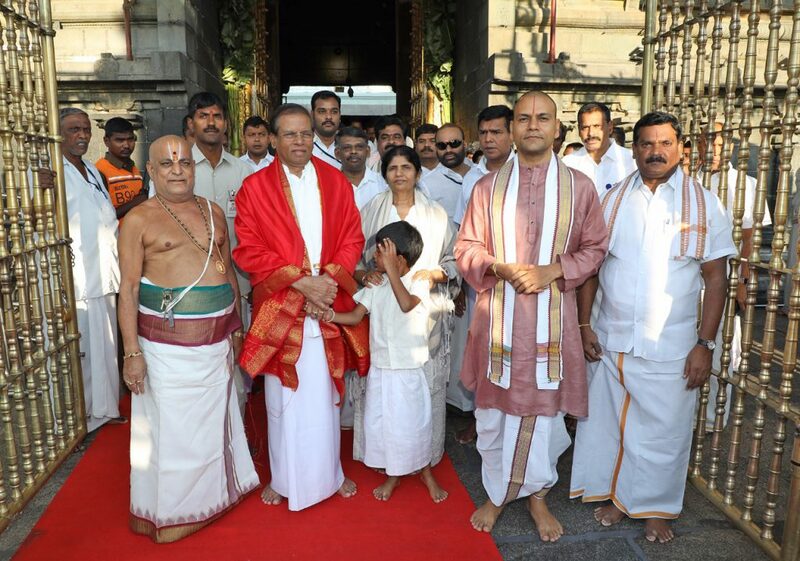 Honourable Sri Lankan President Sri Mitripala Sirisena along with his family and entourage offered prayers in the temple of Lord Venkateswara in Tirumala on Wednesday. The top brass foreign dignitary was accorded warm welcome by TTD EO Sri Anil Kumar Singhal and Tirumala JEO Sri KS Sreenivasa Raju on his arrival at Mahadwaram-the main entrance of the temple. Later he offered prayers to the presiding deity of Lord Venkateswara in the sanctum sanctorum during the VIP break darshanam. After ‘darshan’, the President was given holy water – ‘Teertham’, and was extended ‘Satari’ honours. Veda pundits of the temple blessed him with Vedic hymns at Ranganayakula Mandapam. Later TTD EO Sri Anil Kumar Singhal presented him the theerthaprasadams and laminated photo of Lord. The Lankan Prez also offered prayers in the sub-shrines including Vakulamata temple, Bhashyakarulavari sannidhi, Yoganarasimha Swamy. Srilankan Embassy Deputy High Commissioner Sri Krishnamurthy, protocol Additional Secretary Lt.Col.Ashok Babu, temple DyEO Sri Harindranath and others were also present.